The garden of earthly delights: a vision of innocence and experience, simplicity and luxury, beauty and decadence through the eyes of Flemish and French masters of both art and craft. In the Autumn-Winter haute couture collection, Raf Simons, Artistic Director of Christian Dior, looks to the Old Masters of Flemish painting and to the artisanal masters of haute couture to provide a synthesis of historical form, technique and artistic gesture to arrive at the point of today. The ateliers of the Tailleur and the Flou unite to find both fluid and constructed forms together, where the intricate pleating systems of the flou in crepe de chine – usually reserved for dresses – become the expressive, inner linings of reversible capes and offer the choice of a public or a private pleasure for the wearer. 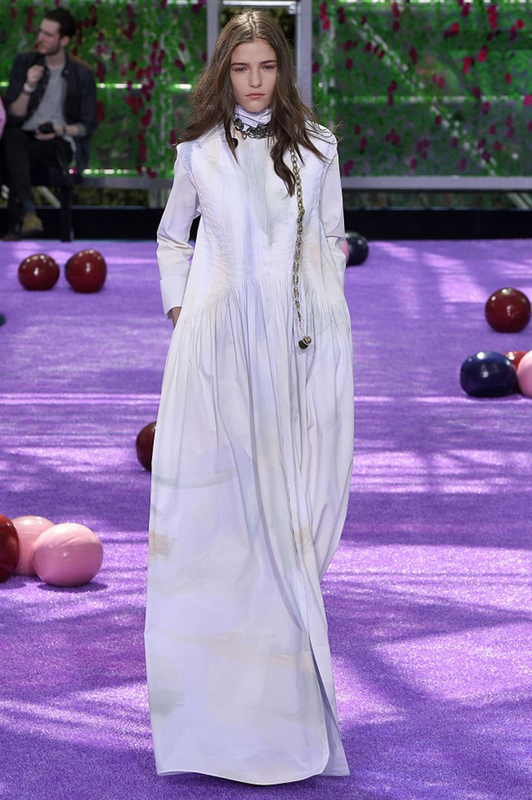 The famous Dior manteaux show their similarities to the mantles of the late Middle Ages and to the gowns of the Belle Époque, with a vast and dramatic utilisation of silk taffeta in their construction. Meanwhile, the Dior jewellery is at its most luxurious and expressive this season, finding itself as a new form of ‘Cannage’ chainmail in gilets to be worn over garments and as heavy, dripping, ‘charmed’ chains to be draped over them.